Grain growers can be confident that their efforts to improve crop productivity and maximise yields are not jeopardising their chances to improve soil health, according to the results of a recent review. 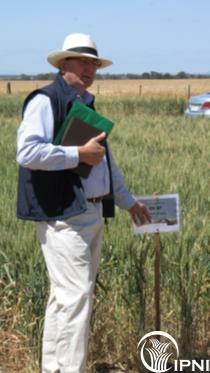 Dr Rob Norton, Regional Director of the International Plant Nutrition Institute, reviewed the effect of a range of nitrogen and phosphorus rates on soil carbon over 15 years of continuous cropping at Dahlen, near Horsham in the Victorian Wimmera. “Soil carbon is an important indicator of soil health and because it takes a long time to change, it can only be assessed using information from long-term experiments like Incitec Pivot Fertilisers’ Dahlen research,” he said. Dr Norton concluded from this review that providing adequate phosphorus and nitrogen was the key to improving soil carbon levels in the experiment. Sulphur and zinc were added to all plots to ensure these nutrients were not limiting. “At the start of the experiment in 1996, Colwell soil phosphorus levels were low, at 24 mg/kg,” he said. “Total soil nitrogen was also low, so that crop performance was limited by both phosphorus and nitrogen. “After using either 9 or 18 kg/ha of phosphorus annually with any rate of nitrogen, soil phosphorus levels increased to 40 or 70 mg/kg and contributed to better yields and crop productivity. Soil carbon increased from 1.14% in 1996 to 1.37% in 2011 with annual applications of 18 kg/ha of phosphorus and 80 kg/ha of nitrogen. However, where crops received 80 kg/ha of nitrogen and no phosphorus, total soil carbon remained at 1.08% and Colwell P had reduced to 18 mg/kg by 2011. The soil carbon levels increased by a greater amount as more phosphorus was added. Dr Norton said the analysis also showed that high rates of nitrogen did not reduce soil carbon levels. Dr Norton said it was no accident that the best average yield results over the 15 years were also achieved with 18 kg/ha of phosphorus and 80 kg/ha of nitrogen. “Soil carbon is mainly derived from plant material, so good crops help make healthy soils,” he explained. For more information, Dr Norton’s full report is available at http://anz.ipni.net/article/ANZ-3124.